Dessert is an often overlooked area in institutional food and beverage- there are great opportunities there to save money, as well as create value added quality items. These cream puffs are deceptively simple, and create an elegant and comforting traditional sweet treat. A profiterole or cream puff is a French dessert pastry ball filled with whipped cream, pastry cream, or ice cream. The puffs may be decorated or left plain or garnished with chocolate sauce, caramel, or a dusting of powdered sugar. In a large pot, bring water and butter to a rolling boil. Stir in flour and salt until the mixture forms a ball. Transfer the dough to mixer with paddle attachment. Beat on medium speed until mixture has cooled to room temperature. Add eggs slowly while beatings until all are incorporated. Pipe or scoop onto parchment lined baking sheet. Bake for 20 to 25 minutes until golden brown, center should be hallow and dry. 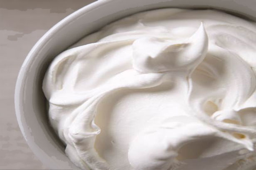 Whip cream to stiff peaks, and combine with pudding. Fill cream puffs with filling. The filling for these is the best part. Quality canned vanilla pudding brings a wonderful rich taste at a great price for a pantry staple item. 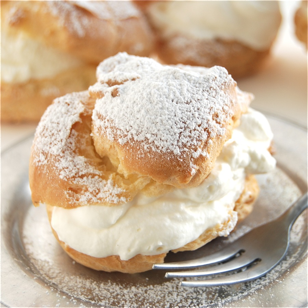 Combine this with some fresh whipped cream adds lightness and texture perfect for a traditional cream puff. Most people would shy away from the idea of making home made pastry products in an institutional kitchen. The great part is the simplicity of the recipe in this case. An almost infoulable procedure with a simple list of staple ingredients. As long as the oven is preheated properly, these are nearly bulletproof. 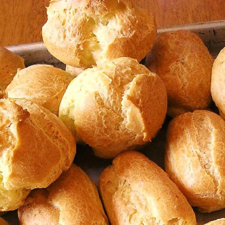 This recipe will yield aproximately 100 dessert sized cream puffs with light and sweet filling. Serve them topped with powdered sugar for an elegant treat. You have the option of piping the filling inside, or splitting them with a knife for a sandwich approach. The filing is where we can get creative in this recipe. Any flavor of pudding makes for a great alternative. Also try filling with one step mouse mix, or using a vanilla or neutral base with the addition of flavoring ingredients. You can top these with anything! Dip in chocolate sauce and garnish with nuts, sprinkles or caramel drizzle. This is particularly nice when split and stuffed with a scoop of vanilla ice cream. The creation of simple yet elegant menus can be aided by dietary management software; this allows the analysis necessary to create nutritional yet flavorful dishes that remain cost effective. By reviewing the costs and yields of ingredients by items and seeing real time nutritional information of a recipe, you can create menu staples that will stand the test of time by satisfying your clients every needs. Also by having dietary management software your information is organized in a more efficient and streamlined manner allowing your chefs more time to create, improve and train their cooks to enhance guest satisfaction.